Criticism of black Americans and their voting rights and preferences from the GOP right-wing is undoubtedly dangerous and illiberal. In this interview however, I discuss, from the leftist perspective, racial politics in the US and attempt to uncover how and why so many African-Americans are loyal to the Democratic Party establishment both locally and nationally. Kamau Franklin is an activist and attorney based in Atlanta. He has been a dedicated community organizer for over twenty years, first in New York City and now in the south. For nearly two decades he was a leading member of national grassroots organizations dedicated to the ideas of Malcolm X. Franklin has also led and developed community cop-watch programs, electoral and policy campaigns, and freedom school programs for youth. He served as co-chair of the National Conference of Black Lawyers and the New York Executive Committee of the National Lawyers Guild. He is currently the Political and Social Editor for the on-line news publication Atlanta Black Star. Daniel Falcone: What do you think are the reasons and the implications for the Democratic establishment to so readily count on African-American votes? And what are your thoughts on the hopes and prospects that black people can abandon this wing of the party, like take say, supporting a more progressive Sanders type message? Kamau Franklin: There has been a marriage of convenience between the Democratic Party and the collective voting bloc of Black people that long ago gave up on anything substantive. The historical shift of black people from the Republican Party of Lincoln to the lukewarm embrace of the Kennedy Democrats was one-hundred years in the making. Within the two parties, the amount of open hostility has determined which mainstream politic black people will engage in to find some expression of non-threatening acceptance. When Kennedy, Johnson and the elite black civil rights leaders [not MLK] began to strike bargains to open-up society, the tacit exchange was to bring black votes to the Democratic Party, where it’s now become the de-facto home for the vast majority of the participating black electorate. Finally the black “liberal” leadership class of ministers, elected officials, pundits, public intellectuals, and moneyed black elites, who have the greatest interest in stability and the status quo, benefit the most from this arrangement with the Democratic Party. Most have no vision or interest in pushing a black agenda that does more than ask for acceptance or a lessoning of open racial hostility. The flaw in the Sanders campaign is that he saw himself as a message candidate first and not an electable candidate. If he saw himself as an electable candidate he would have put more resources and spent more time cultivating black votes, while figuring out how to get around that black-leadership class that had a thirty year relationship with the Clintons and their brand of Democratic bargaining. The two corporate parties won’t change and care for black majority interests. Black people have witnessed a black President having a limited ability to shape policy that advanced black majority interests replaced by someone openly hostile to those limited policy changes. This is an opening for black people to think about our relationship to America. Daniel Falcone: With Trump in office, an effort is being made to not only wax nostalgic for Obama but also for even Reagan and Bush, while feeling sympathy for the FBI, CIA and the US military. Am I correct to presume that this is the territory of largely white-Americans or do you think a fair amount of black-Americans are expressing this sympathy as well? Kamau Franklin: I think black people, much like white people, like symbolism. There is certain nostalgia for what was perceived as an administration that considered some of the short-term interest of black people. We must separate perception from reality. The Obama years for black people were years of struggle to reclaim some financial footing, jobs, etc. [These are now the] good ole-days, since the Trump presidency marks an era of a return to open white hostility to black people and others. The Trump presidency that was supported by the majority of white Americans has led to serous up-ticks in hate-crimes with an empowered proto-fascist element to gain traction. Daniel Falcone: Right now in New York City, city council primaries are heating up as well as a possible shakeup in race for mayor, all receiving local and national headlines. 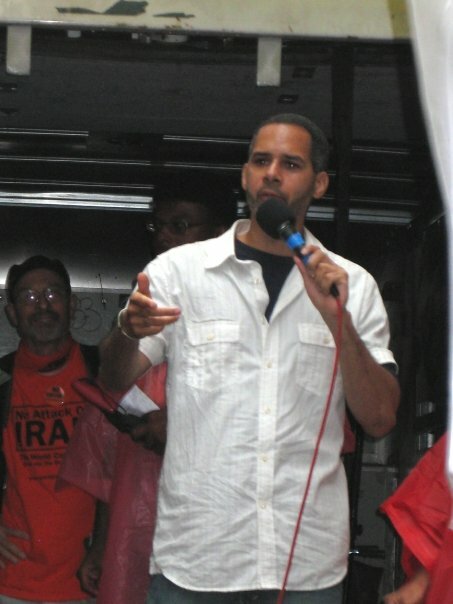 In my district, a younger intellectual Haitian-American named Phil Marius is running as a Democratic Socialist on the Sanders agenda while his opponents are pro-police and pro-development African-American “Hillarycrats.” Much of the support, largely emotional, is for the more centrist and conservative candidates comes from Democratic Party loyalists. What exactly is taking place here in this perceived ideological and generational divide? Kamau Franklin: [It sounds like everywhere else, where] the black leadership class is tied to the “Hillarycrats.” Whether through patronage, status, or a handshake, the bonds are more important than the results. The Democratic Party is a well-resourced machine, that may be dysfunctional at times but it still has the structure and money to give out rewards and punishments. The older black leadership believes that whatever small rewards they get is more important than re-evaluating the state of the relationship and which black majority interests get served by continuing to give cover to this section of the party. The Sanders campaign has allowed for an opening fora direct challenge of that relationship. The Black Lives Matter Movement, at least a wing of it deserves credit for cultivating a resistance to status quo politics and some leftward shifts for black youth that also allows for a direct challenge to the corporate Democrats. I caution that a shift to a social-democratic Democrat however, is going to change the power dynamics for the larger black community. Electoral power would have to be tied to outside organizing, economic, and social institutions that black people can control in order to dictate the use of any new-found electoral victories. Without that level of organization elected officials respond to the pressure of [special interests and their] needs. Daniel Falcone: Establishment Democrats of all races rarely discuss housing and gentrification and see voting as the main form of political involvement in the society. Do these types of phenomena make you think that class trumps race as a national issue? In other words, poor white and black people are often left behind by the party because of Democrats and racial politics. Is this valid in your estimation? Kamau Franklin: I think elite or upper class needs certainly trump race and working-class issues. Free-market ideas on how housing is created and distributed, is not only anti-black but its anti-working class. The idea that real-estate developers and agents with help from elected officials create gentrified housing markets is a known-known. These same elected officials that declare shock and sympathy after the tax-breaks and zoning law changes they developed and voted for lead to housing booms that destabilizes communities and pushes out long-term residents. This is criminal. The Democratic Party at least on a local level, in large cities are much more responsible for this than their right-wing colleagues because Democrats both black and white are normally the majority where the worst cases of this type of gentrification is happening. The [establishment] Democratic Party is not a interested in their constituents but one that is interested in receiving payments from special interest groups and positions after their electoral career. Any elected official in these cities that is serious about stabilizing communities, racial or working class would challenge these forces and create alternative models of housing development. Daniel Falcone: Can you discuss the difficulty of being African-American and holding critical views of Obama, the NAACP, the Congressional Black Caucus, black media figures, etc.? Is there any chance to have older African-American Democrats defect from Clinton type loyalty? The younger black population seems to be more in tune with what the country needs generally speaking. Am I correct in this regard? Kamau Franklin: It certainly takes you out of the mainstream discussion of which way forward for black people. The Democratic Party supports gentile language that is about alleviating the worse aspects of black suffering and Pollyanna language on the US as a melting pot. But there are no serious plans within the Democratic elite to battle capitalism or white supremacy. Although I think a greater number of young people (particularly young Black people) recognize this, I don’t think it has translated into solid next steps that move black people away from engaging overwhelmingly in policy change work. Although necessary on some level for short term relief, there is a trap in dealing only in policy initiatives. One trap is that liberal foundations will only fund policy work because it still leads back to being engaged only in some form of electoral work, even if not directly with the Democratic Party, there is still a tie that binds. There are not enough examples of clear capacity building enterprises that create models of community development outside of the dominant structures. I’m engaged in a project now called Community Movement Builders that is working on the development of self-reliant institutions as the main goal and policy work, again important work, but secondary to creating resources that are in the hands of the black community.